I have a Schwinn Boundary 2017 and it came with a quick-release front wheel. I noticed that no matter how tight I put the skewer it would be in a different position after extreme braking. The bike shop guy told me that the fork is originally for a 10 mm bolt on axle with the splined washer that secures it. Sadly a front quick-release is as we all know 9 mm and rear is 10 mm. 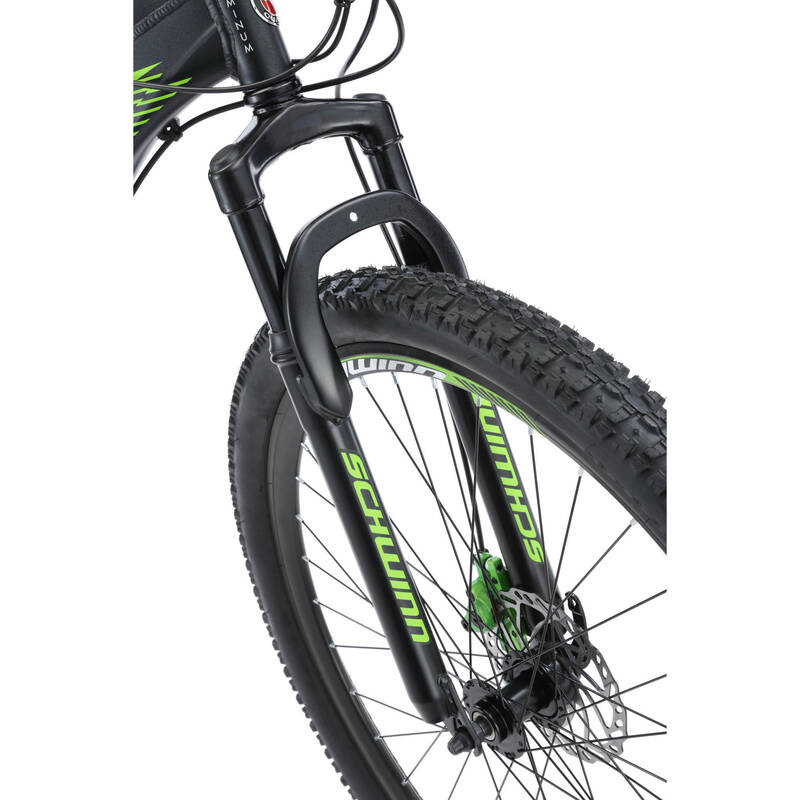 This front axle is allowed to move side to side under large lateral forces and the quick-release axle hits the bottom of the lip on the fork which is about 4 mm. Not a lot but it’s enough to offset the wheel in the fork by dang near an inch and makes it impossible to keep my front rotor aligned properly. I shrugged it off for about a year then my pads wore to the bone and I replaced the pads and disks. I upgraded from 160 mm rotors to 180 mm and the axle now moves way easier due to more leverage from the rotor. The rear axle had a similar problem but just recently I used aluminum spacers and put them in my mounts to fill the gap between the axle and frame. It has worked for the back, it no longer has movement or at least an unnoticable amount. I did the same with the front... only it made the front even worse, it just made it move easier and pulled the greatly bonded epoxy holding the spacers in. I wanted to know if anyone else has had this problem, if there's anyway to fix these two axles because im about to get some grippy Maxxis Minnion DHF tires which will add to the problem and I would like to fix it before then. The clamping force should be what keeps the axle in place, not the drop out. As you found out hub brakes, such as disc brakes, put more stress on quick release skewers than rim brakes. While drop out design can help (e.g., forward facing), this ultimately is a failure of the skewer clamping force. Unfortunately, not all skewers are created equal and many bike builds use cheap skewers. In fact, most quick release skewers I have used are deficient in this regard allowing the front wheel axel to deflect under heavy braking. This is one of the reasons thru-axles have become so popular for disc brake applications. Shimano skewers (Deore and above) tend to be some of the best in terms of clamping force. See if you can track one down for the front, a better skewer for the rear isn’t required as the braking forces are different. Note that the bike was spec’d from the factory with a quick release. Try cleaning the contacting surfaces of the quick release and fork with some degreaser and/or rubbing alcohol to remove any grease or other stuff that might be causing the slipping. Not the answer you're looking for? Browse other questions tagged mountain-bike brakes wheels disc-brake quick-release or ask your own question. Do quick release wheels require certain design in the fork? Front caliper rubbing spokes, should I dish the wheel outward? Can I fix or replace the quick release lever on my thru axle?